Spring is in the air…. Uh, I mean water! 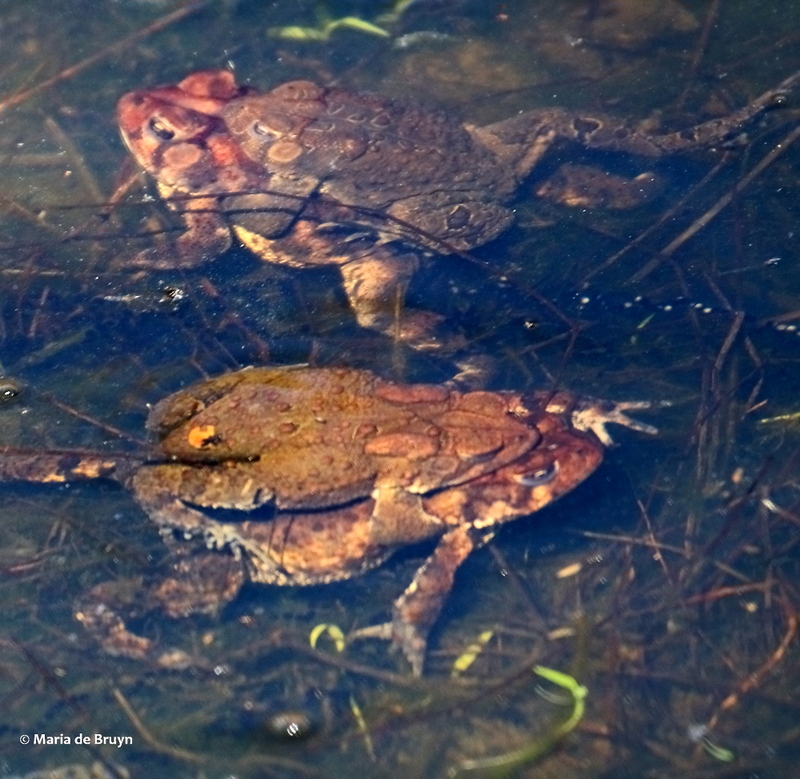 The sound made by the male Eastern American toad (Anaxyrus americanus americanus) when he is ready to breed has been likened to an old-fashioned ringing telephone. 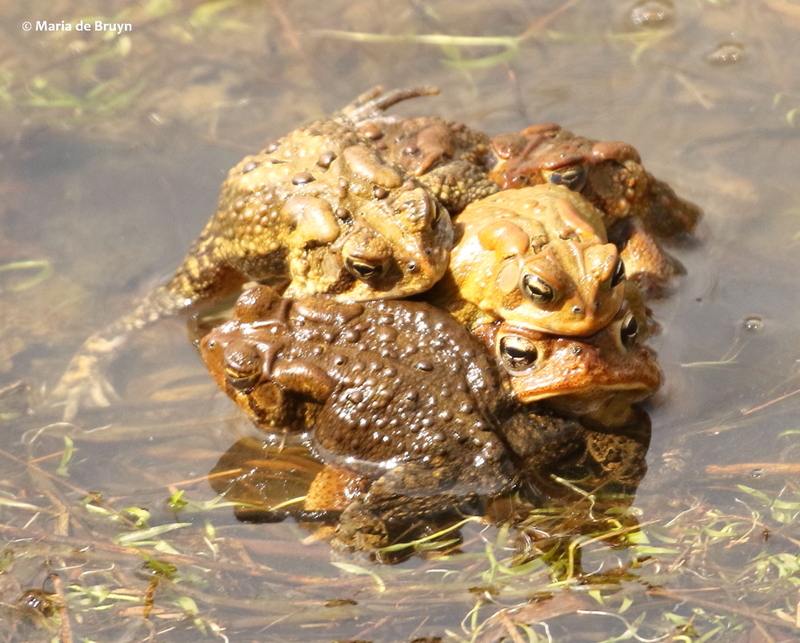 It can last from 6 to 30 seconds and when multiple toads are calling at the same time, they create a very loud and penetrating “concert”. It doesn’t sound like a phone to me; you can judge by listening to the video. 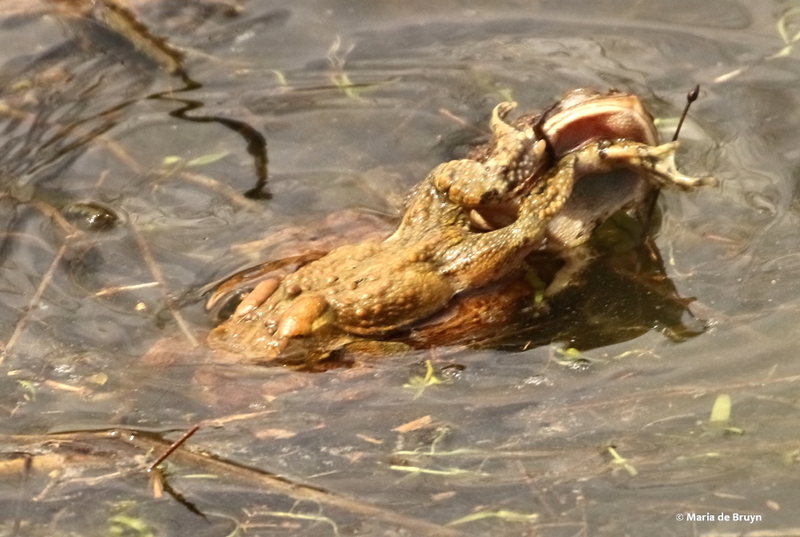 I only saw a couple of the toads with inflated throat sacs. The sound was very loud, however, and the water was roiling with moving heads topped by periscope eyes, warty bodies and thrashing legs. 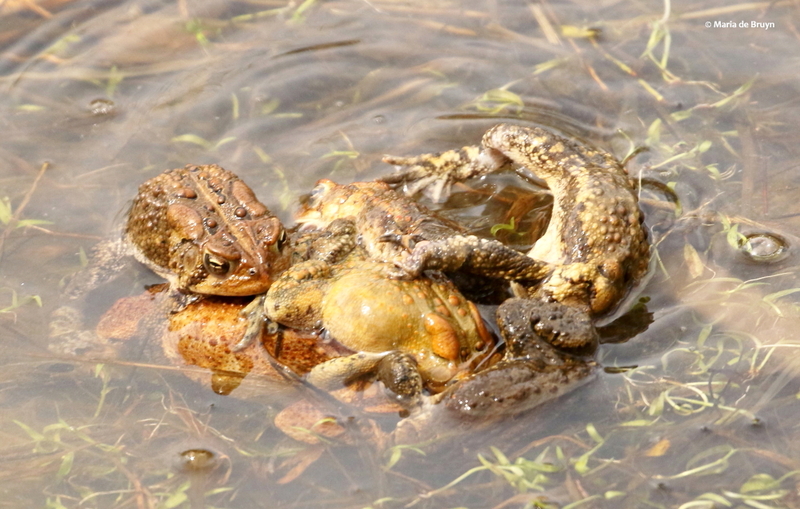 Before examining how the toads were going about their reproductive endeavor, a little biology lesson. 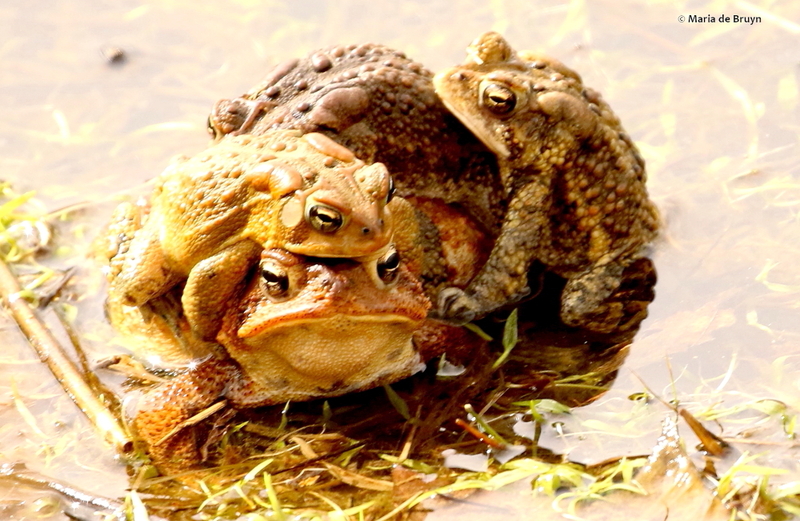 Toads are a sub-group of frogs; while most frogs have moist skin, toads generally have drier and wartier skins. They vary greatly in color, including shades of yellow, brown, black and red, and may be speckled or have solid hues. The skin color can also change in response to stress, temperature, humidity and habitat. 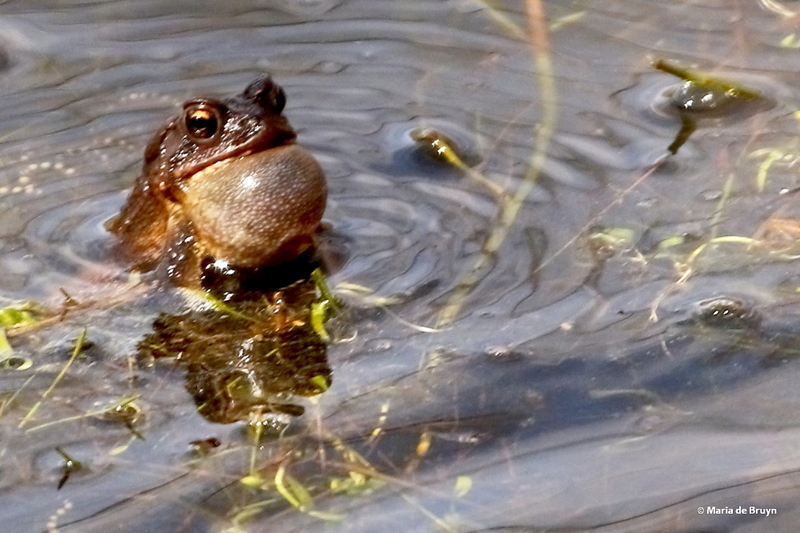 American toads have two glands at the top of their head behind the eye crest. These are parotid glands that produce a neurotoxin, bufotoxin, which can sicken and even kill a predator. The milky substance can produce skin irritation in human beings and can be dangerous to smaller mammals (like dogs). 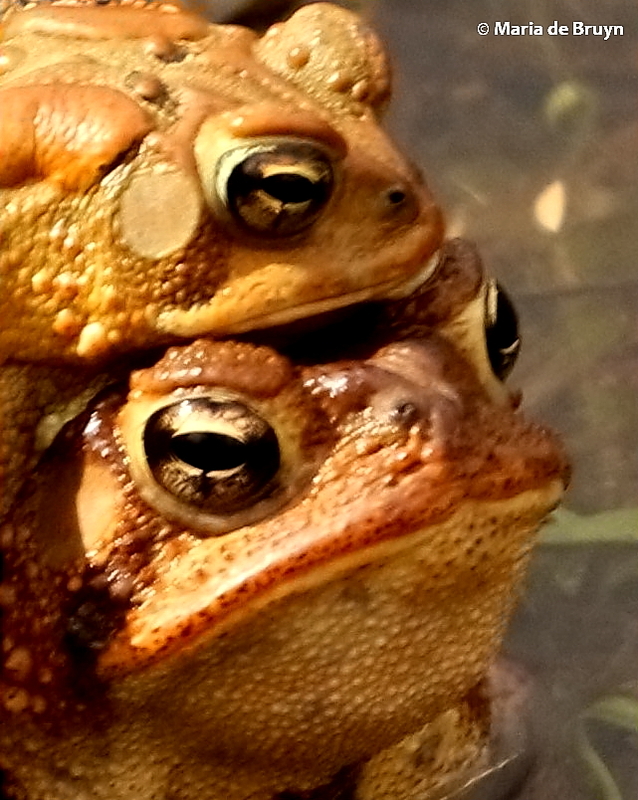 Like birds, toads have nictitating membranes, transparent eyelids that help protect the eye. 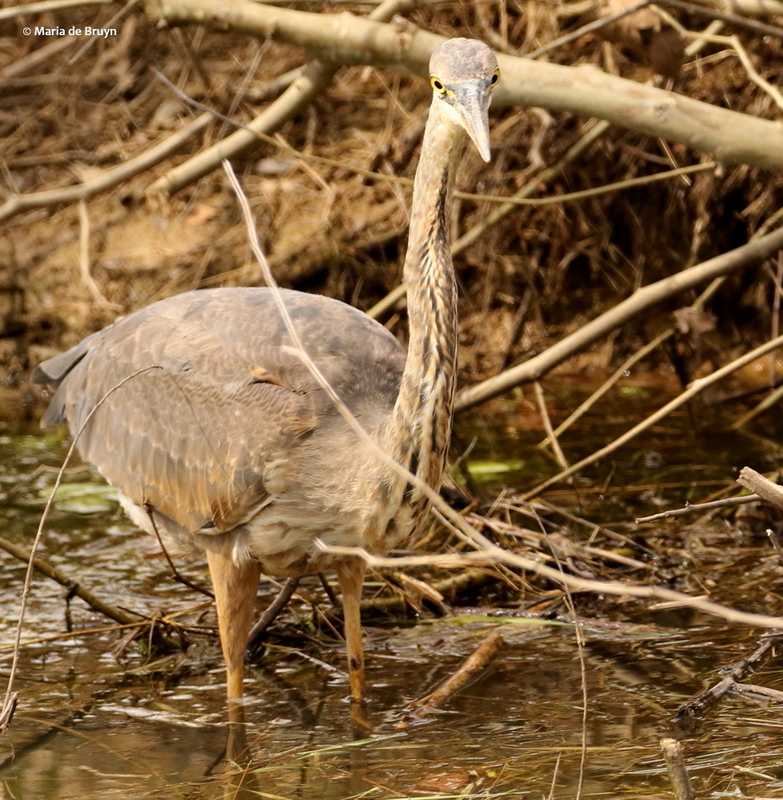 They sometimes raise the nictitating membrane half-way so that they retain sharper vision. 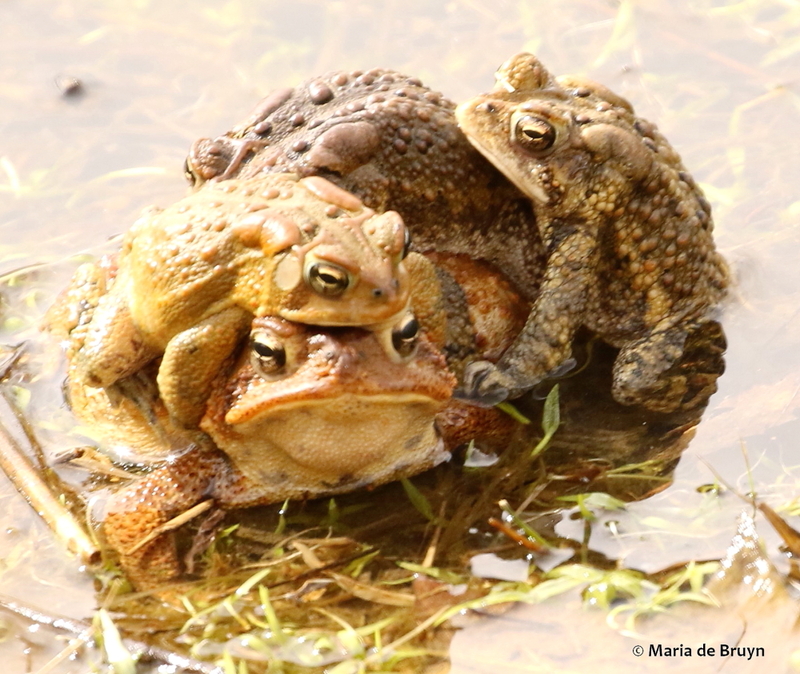 Toads actually spend a lot of their lives on dry land, eating insects as well as worms, slugs and other small invertebrates. A particularly fascinating fact is that they use their eyeballs to help swallow food – when they ingest their prey, the eyeballs sink down into their mouth and help push the food down their throats!!! At times, they created little whirlpools as they bumped up against one another or tried to mount a neighbor. Sometimes, a large female with a smaller male atop her would rest quietly under water, apparently trying to avoid notice. 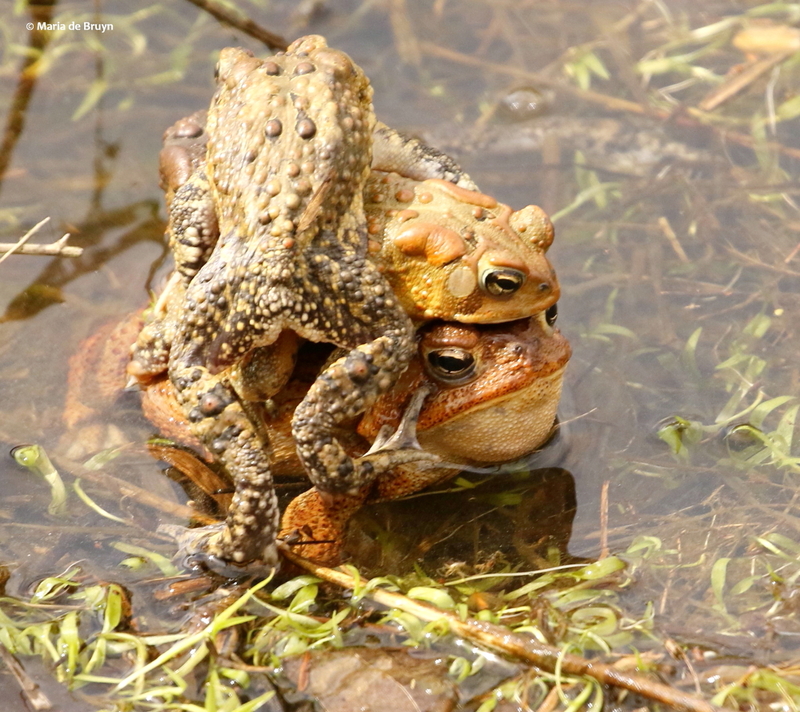 This strategy did not always work, however, and sometimes one or more other males would try to join the pair already in amplexus (i.e., when the male grasps the female with his front legs and fertilizes the eggs as she releases them from her body).. 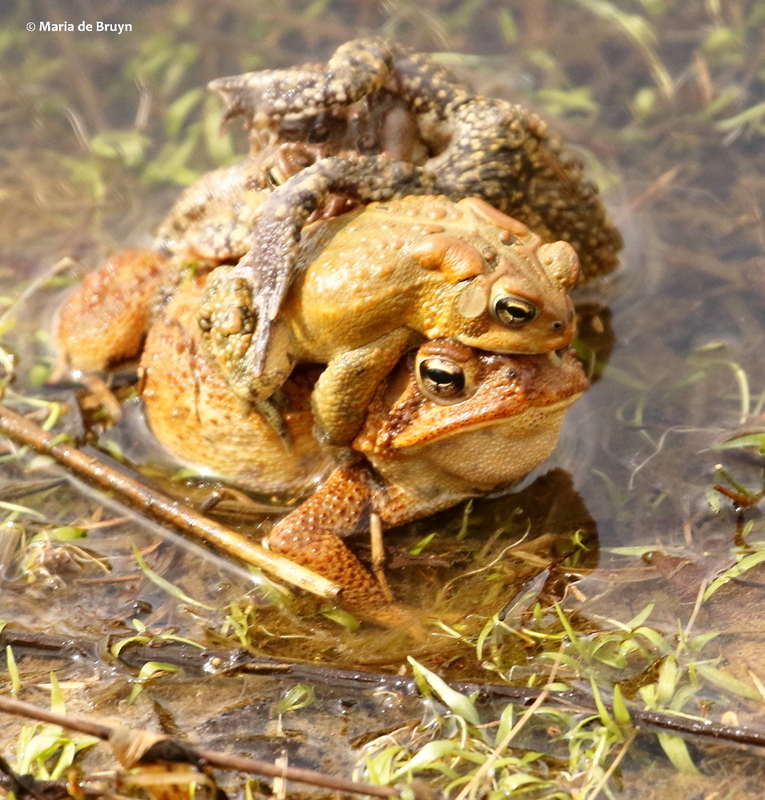 The female toad ejects her eggs in two strings, which are immediately fertilized by a nearby male spurting out a stream of sperm. (Frogs lay their eggs in clusters.) 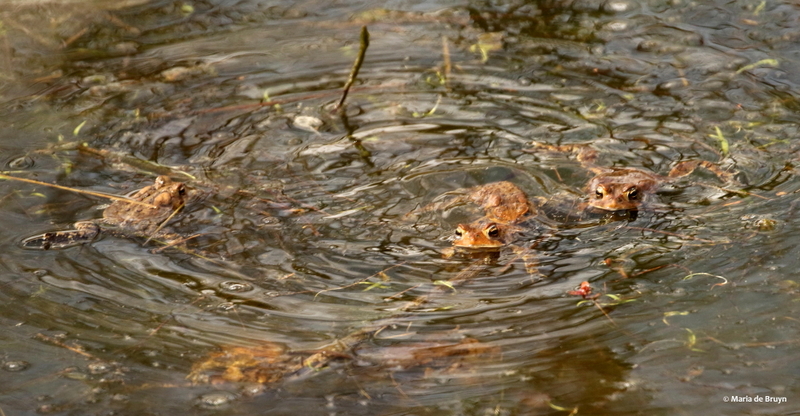 Tadpoles will emerge from the eggs within 2–14 days and reach adulthood within 50–65 days. They become sexually mature at 2-3 years. In one case, I developed a real sympathy for a particularly large female. She had a small male astride her who resembled her in coloring and they looked to be peacefully joined. Then another male spotted them and he launched a sneak attack, trying to usurp the position of her already-present suitor. The first male clung on tightly. No. 1 pushed No. 2 away with a hind leg again and again. 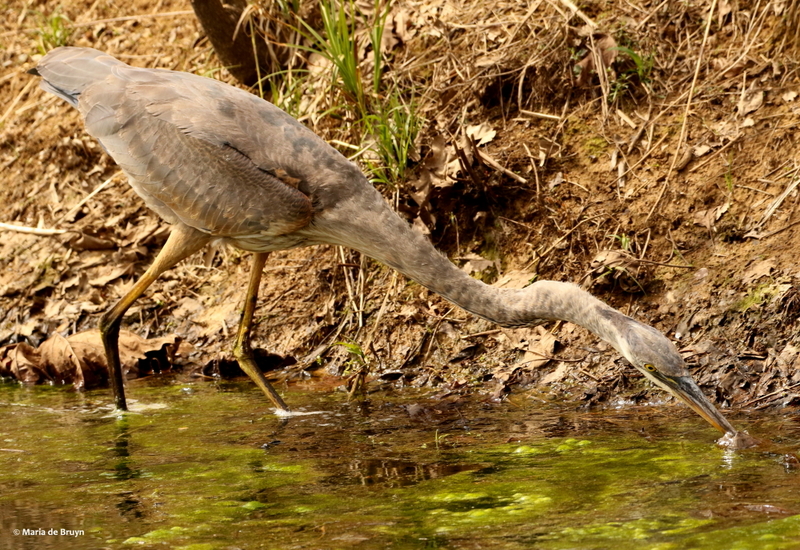 In the meantime, a great blue heron (Ardea herodius) who had been feeding on the other side of the pond, made its way over to the site of toad frenzy. S/he had been eating small fish and amphibians. 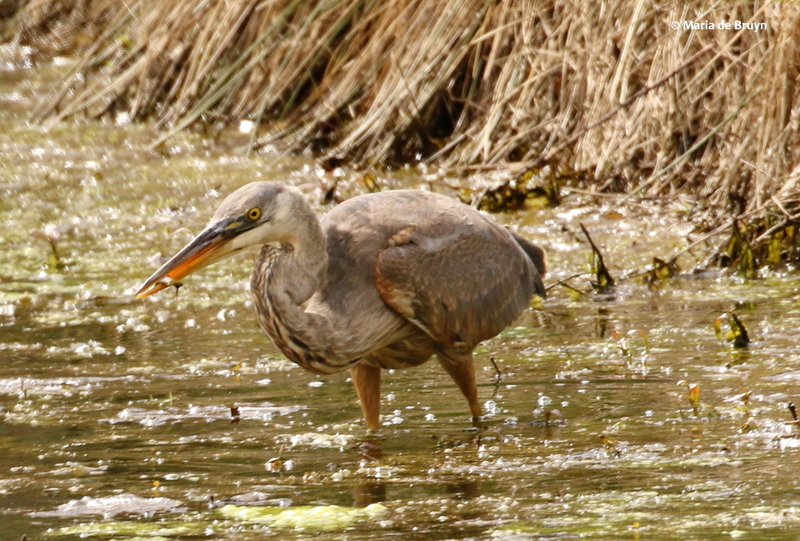 I thought the heron would plunge into the midst of the numerous toads for an easy meal, but instead the bird looked around and then skirted the group, veering away to the shoreline. 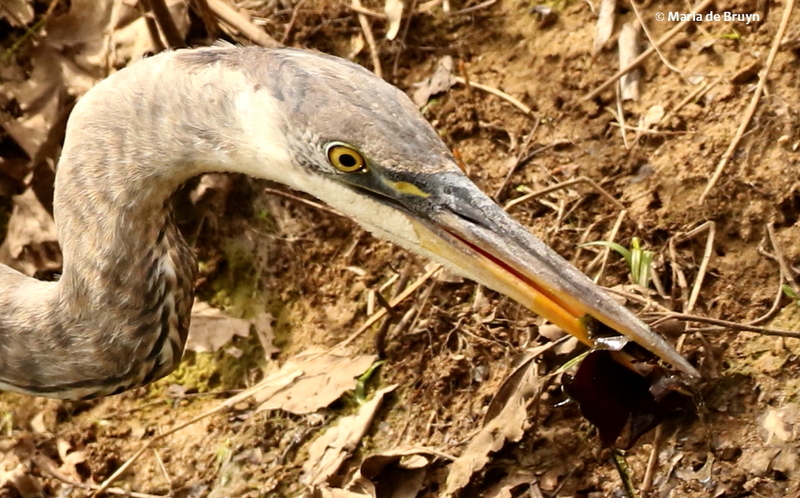 Perhaps some instinct made the heron avoid the group during a reproductive event? Or s/he was put off by the vigorous activity of the potential prey? 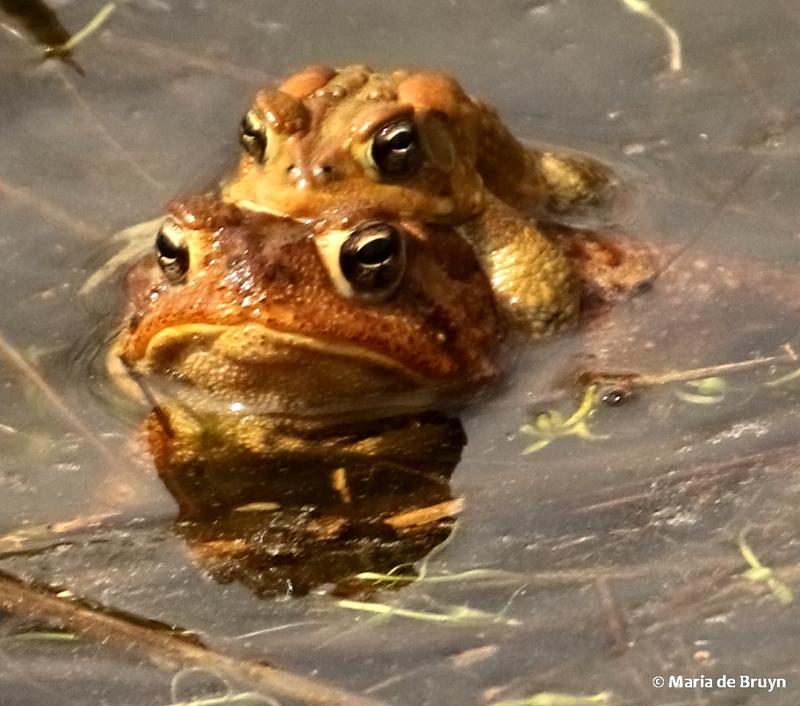 A second rival toad then joined the first, who was still trying to get the original mating male out of the way. 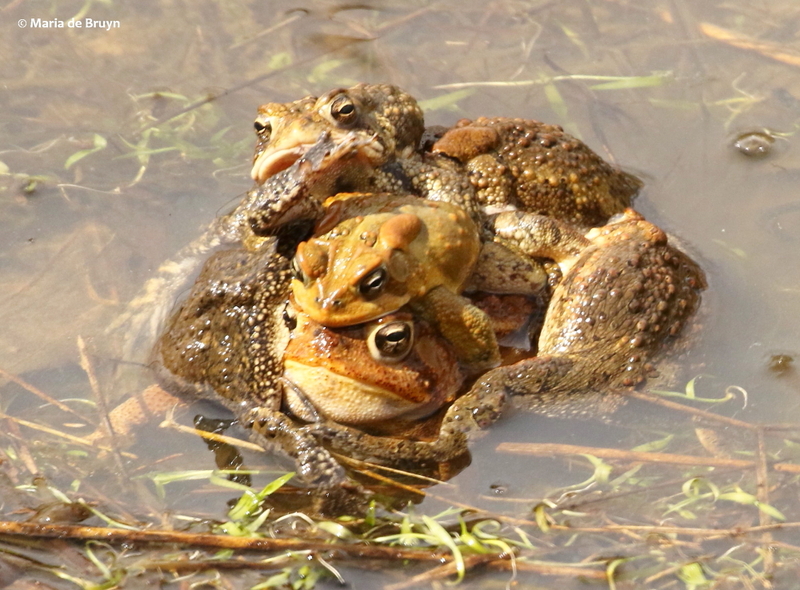 Eventually, a third, fourth and yet another male joined the group and the poor female was weighted down by 5 – FIVE! 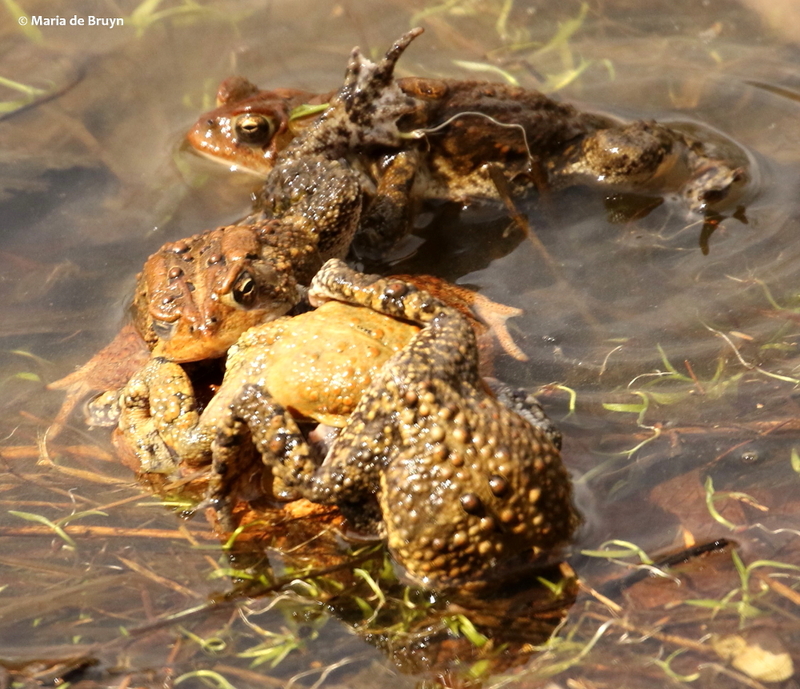 – male toads all vying for the prime spot on her back. Often her head was pushed down under water. 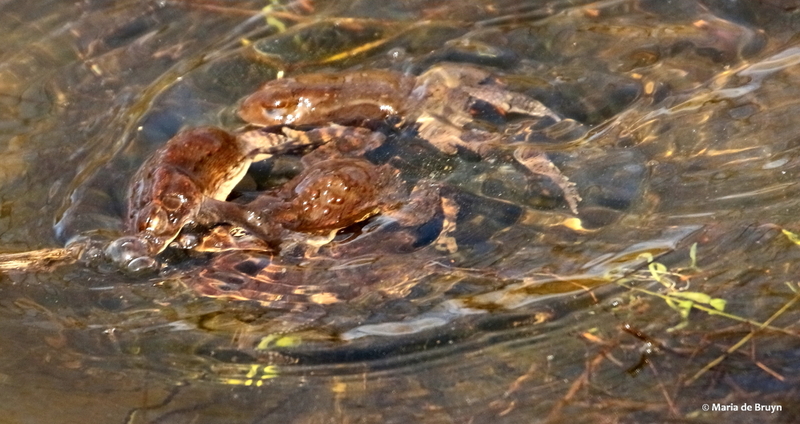 The first male clung on with great determination, often being pushed down under water as well as the other males piled on. He was NOT going to give up. Ms Toad did not like this state of affairs. 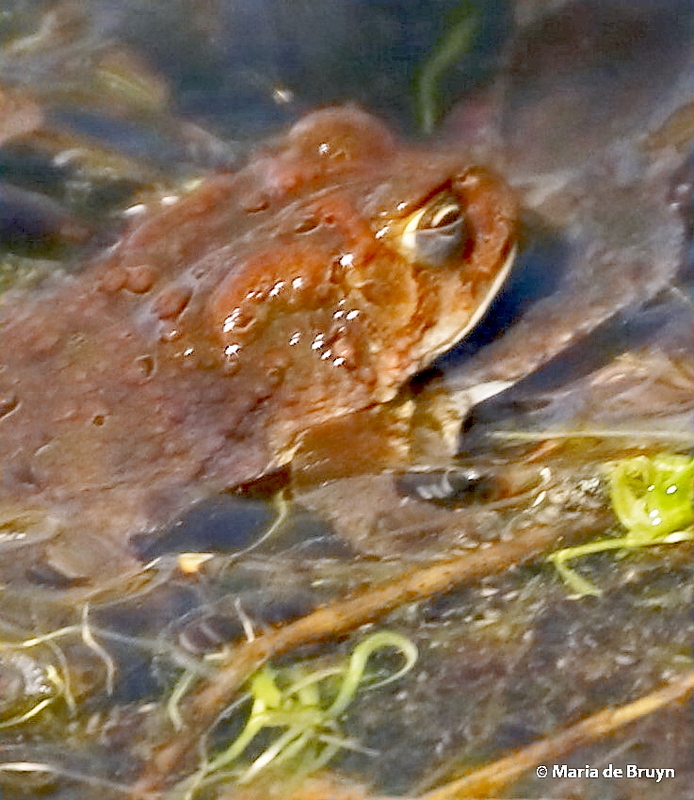 She laboriously began moving from a deeper spot in the pond to the pond’s edge. This was a slow process, made difficult by the clinging crowd who must have weighed a good deal as a group. 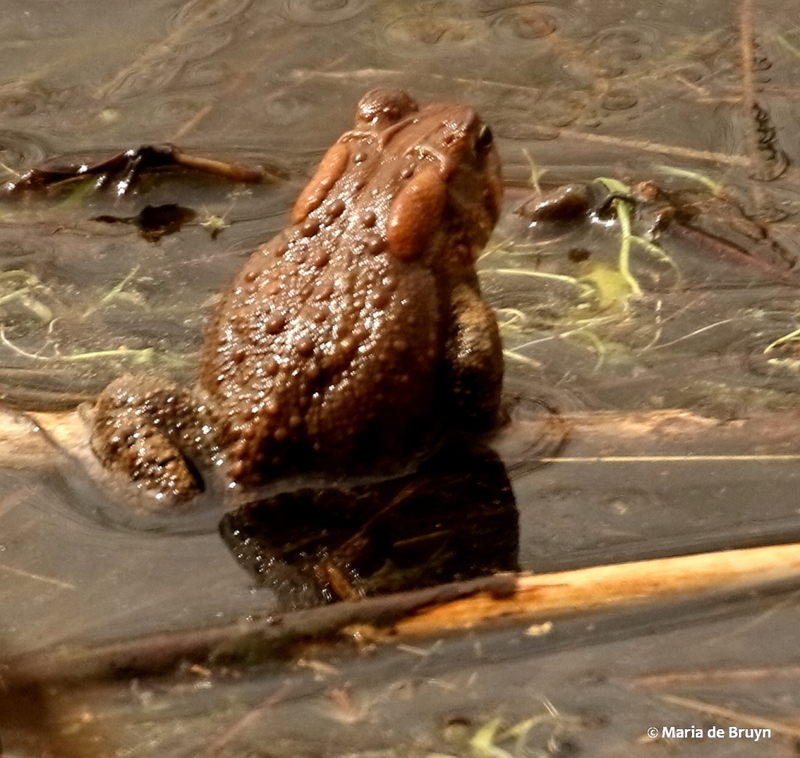 I thought she might be trying to get to more shallow water so the toad “knot” would not keep her submerged. 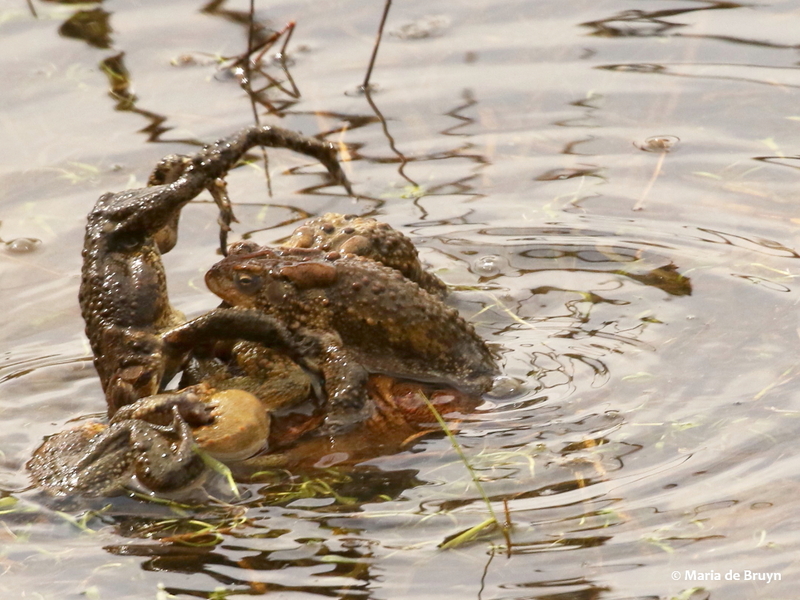 Toads can breathe under water like frogs because they can absorb oxygen through their skin. They do have lungs, however, and if these fill with water, they can drown. 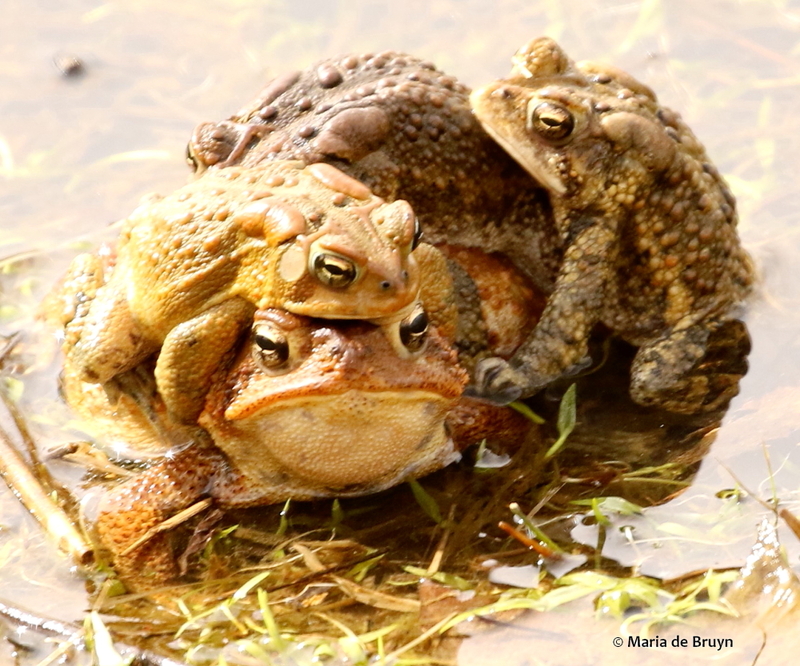 A fellow Facebook nature lover told me that she had seen expired female toads with males still clinging to them. 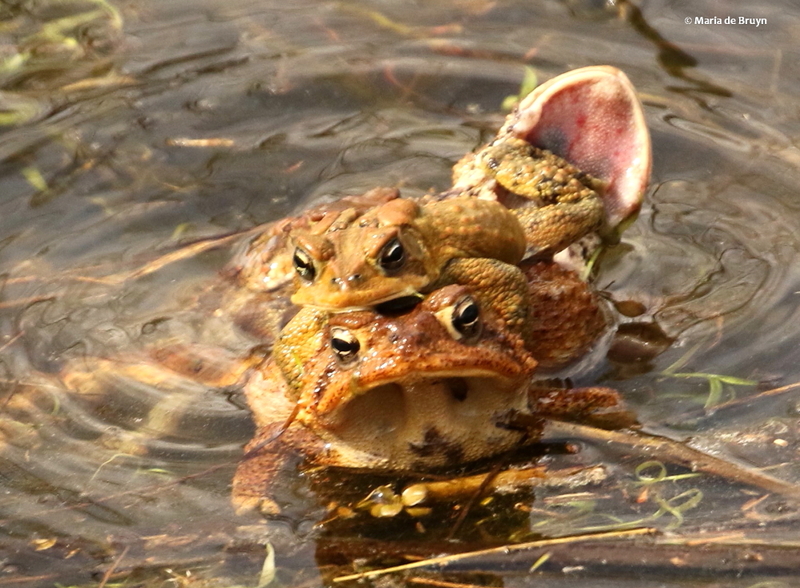 A toad knot can therefore unfortunately result in maternal mortality – the demise of a mother giving birth (to several thousand eggs; most of the tadpoles do not survive). 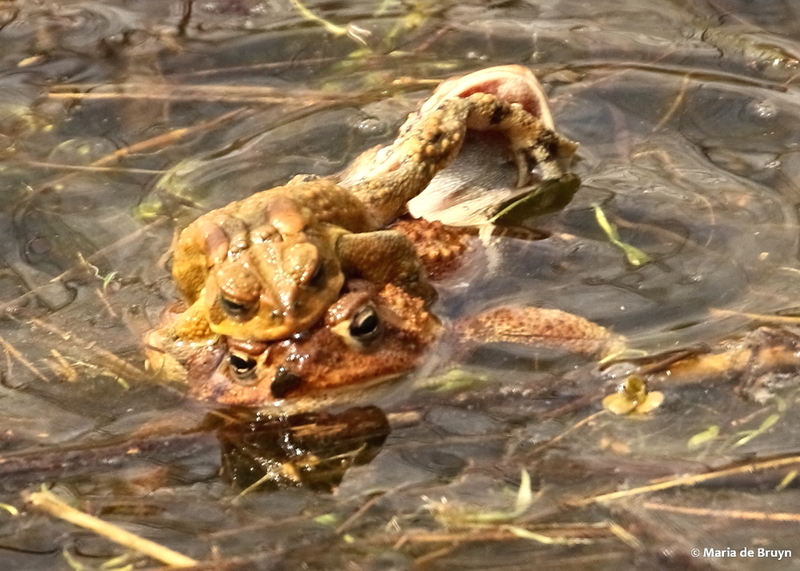 I soon left the scene after Ms Toad had reached the side of the pond and could keep her head above water. It was noticeable that her throat pouch was inflating and deflating – perhaps she was breathing deeply to compensate for lack of oxygen when she had to suffer a submerged head due to the over-amorous males. I know I am anthropomorphizing, but I do believe that she likely felt the amphibian equivalent of relief and was looking forward to the end of that day!